The NO.1 program to cut all VOB videos with simple mouse clicks. 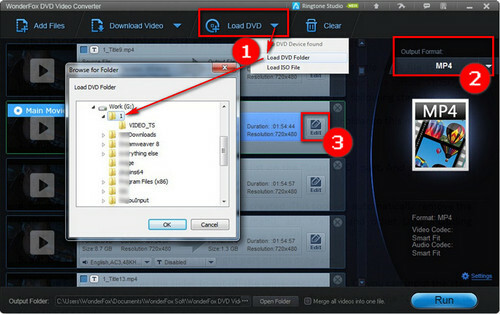 Have some VOB files that are created from DVDs or downloaded from the web, and eager to cut them into smaller files? It is extremely simple now. As we all know that VOB files are typically stored in a VIDEO_TS folder, along with a mass of .ifo and .bup files, and it contains all the data of a DVD disc. Still, there’s a chance that all episodes will be saved in a single large VOB file. So when you want to cut the particular part off the whole video yet the tools you find on the internet are complicated to handle. Take it easy as this article will show you the simple yet practical solutions with a dependable VOB file cutter. WonderFox DVD Video Converter is able to cut VOB files that are created from DVDs or obtained from anywhere else. It can crack any DVD copy protection and recognize the VOB files saved in a VIDEO_TS folder for convenient video trimming. The latest version of this DVD Video Converter can split the VOB files with three times the acceleration. Download it to have a try! To cut the above two kinds of VOB files, you do not need to install several programs to help you. Here’s the once-for-all solution, using WonderFox DVD Video Converter, a versatile tool that can rip DVDs, convert video/audio files as well as download online resources, etc. Which means you it can serve as a perfect VOB cutter to split all you VOB files effortlessly. Under this circumstance, you cannot split VOB files directly since the single VOB file is just an incomplete fragment of a DVD movie. The correct method is to convert the whole VIDEO_TS folder to the full-length movie then you can cut a video clip. Before you cut the VOB files, you need to do some preparations: First of all, create a new folder and name it at will. Then move the VIDEO_TS Folder to this new folder. Then launch WonderFox DVD Video Converter. Click the triangle icon to open the drop-down list on the “Load DVD” part. And choose “Load DVD Folder”. Remember, you are importing the DVD movie from the new folder you just created. This VOB cutter will automatically crack the DVD copy protection and remove the menu, ads, trailer, and other DVD unnecessary information. By the way, it will check the main movie smartly. Choose the preferred output format on the right part of this VOB splitter. For example, you can convert VOB to MP4, AVI, MP3, AAC, etc. Hit the Edit icon, and drag the slider on the timeline to select the wanted part. Or you can input the start time and end time for accurate VOB files cutting. And do not forget to press the “OK” button to save the clipping. TIPS: On this window, you can clearly see that this tool can do more VOB editing work like flip, rotate, add special effect, as well as merge VOB files, etc. Just try these functions if you need. Click the Run button to start to cut VOB file. The whole trimming process will be finished in a flash, and find your final cut video on the output folder. A trustworthy program that can edit your VOB files like cut, trim, crop, merge, rotate, flip, add subtitle, etc. on the fly. Moreover, it supports to convert VOB files to a huge array of file formats: MP4, MKV, MOV, MPG and more. Or you can transcode the VOB videos to iPhone, Android, tablets, PC, TV and other 200+ devices handily. Just have a try here. 1. 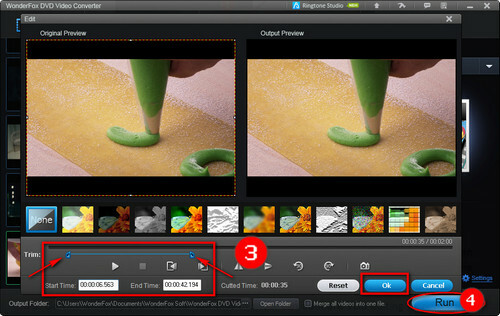 Press the “Add Files” button to load VOB video or simply drag-and-drop the VOB file to the interface. 2. Hit “Edit” to split VOB file by moving the slider on the timeline or specify the start and end time. After that, press “OK”. 3. Set the needed output format on the right section. 4. Click the Run button to trim VOB file now. With the above two methods, I believe you can easily cut VOB files. Now you can start the VOB cutting job with the detailed guides. And feel free to share this tutorial if it is helpful.